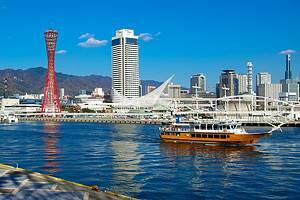 Osaka, one of Japan's largest cities, lies on the south coast of western Honshu at the point where the River Yodo flows into the wide sweep of Osaka Bay, which opens out into the Pacific. Its location on the Yodo delta with its network of watercourses and canals spanned by more than a thousand bridges has, deservedly, earned Osaka the nickname of the "Venice of the East." While the origins of Osaka date back to the mythological early days of the Japanese Empire, today it is undoubtedly one of the most modern cities in Japan, boasting a futuristic skyline along with countless impressive examples of modern architecture. Its world-class status is cemented by its many cultural institutions, from its superb museums and art galleries to its ultra-modern entertainment, theater, and music venues, which together add up to an endless list of unique things to do. When planning your itinerary (as well as considering where to stay), bear in mind that Osaka in fact has two significant city centers. If being close to the top dining, shopping, and entertainment experiences is an important factor, you'll want to spend time in the Minami, or "South" district. Kita ("North"), the traditional business center of Osaka, is certainly worth considering, and is catching up in terms of its shopping, dining, entertainment, and accommodation offerings. Whichever you choose (but be sure to at least visit both), you'll find an excellent transportation system as you go about your sightseeing and explore the best places to visit in the city. Consider traveling to this popular destination in the quieter seasons, such as winter. You'll avoid the crowds at the most popular attractions, and you'll get the chance to experience unique sights, such as seeing Osaka Castle shrouded in snow and lit up at night. Plan your sightseeing with our list of the top tourist attractions in Osaka. Osaka Castle (Ōsaka-jō), completed in 1586 in just three years, was ordered built by famed Japanese warrior and politician Toyotomi Hideyoshi and was, at the time, the largest castle in Japan. Almost all Hideyoshi's military commanders were required to contribute stones for its construction, the largest being the Higo-ishi stone, near the south entrance, standing nearly six meters high, 14.5 meters long, and brought by the celebrated General Kato Kiyomasa from the island of Shodo. After Hideyoshi's defeat in 1615, the castle was destroyed, only to be rebuilt by the Tokugawa shoguns for reasons of prestige. Again destroyed after the fall of the Shogunate, the castle was reconstructed in its present form in 1931. Highlights include the five-story, 42-meter-tall main tower containing a great museum with exhibits related to the history of the castle and the city (it also offers superb views over Osaka from its upper floors). Also of interest in Osaka Castle Park is the Hokoku Shrine dedicated to Hideyoshi and his family. Osaka's best-known temple, Shitennō-ji, can trace its roots back to AD 59 and was Japan's first Buddhist temple. Although rebuilt numerous times through the centuries (the most recent reconstruction took place in the 1960s), this lovely temple remains the oldest such religious site to be officially administered. 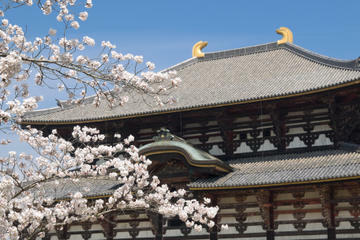 Highlights of a tour include the site's five-story pagoda along with a number of other exquisitely decorated buildings including the Golden Pavilion (Kondō) with its fine statues and paintings, the Lecture Hall (Kōdō), and a lovely covered corridor linking three of the site's gates. Other buildings of note in the complex include the teaching area, a pharmacy and hospital, along with a pleasant garden. Looking a little as if it might be made of giant Lego blocks, the Osaka Aquarium Kaiyukan is well worth exploring. One of the world's biggest such attractions, this walk-through aquarium takes guests on a fascinating tour of a number of marine habitats, including the Pacific Ocean and Antarctica, along with the Great Barrier Reef and Monterey Bay. A variety of Japanese marine life is also featured, including freshwater species, as well as native reptiles and mammals. All told, the site boasts 27 tanks, the biggest being nine meters deep and capable of easily accommodating large marine life including manta rays and sharks. Providing some of the best views over Osaka, particularly of the port area and the Tempozan Harbor Village in which it's located, the massive Tempozan Ferris Wheel is one of the largest such attractions in Asia. At more than 112 meters tall and with a diameter spanning 100 meters, this huge Ferris wheel has been in operation since 1997 and offers a thrilling 17-minute journey that is especially enjoyable at night when the wheel is lit up in a variety of different colors dictated by the weather (orange when sunny weather is forecast, green for clouds, and blue for rain). Thrill seekers can opt for one of the special "see-through-bottom" cars for an incredible all-round view of Osaka Bay. Afterwards, be sure to visit other Harbor Village attractions, including the Cruise Ship Santa Maria, the Legoland Discovery Center, and the Osaka Aquarium Kaiyukan. Osaka boasts not just one but two tall towers that have become synonymous with the city. The oldest, the Tsūtenkaku, is in the city center and stands on the site of a replica of the Eiffel Tower that was built in 1912 and destroyed in WWII. The current structure, completed in 1956, still offers some of the best views over Osaka, especially from the observation level on its fifth floor, where you'll also find a shrine of the God of Happiness. A little farther away, on the outskirts of the city, stands the 108-meter-tall, red steel Kobe Port Tower. Opened in 1963, this earthquake-proof structure also boasts an observation deck and a rotating restaurant, both affording great views over the city and the Kobe Port area. Both towers are particularly pleasant to view at nightfall when they are lit up. The National Museum of Art, Osaka (NMAO) is a unique underground art museum just a few minutes from the city center on Nakanoshima, a small island between the Tosabori and Dōjima rivers. Opened in 1977, this important gallery contains a large collection from some of the leading international artists of the post-war period, including examples by Picasso and Cézanne and Japanese artists Kuniyoshi and Foujita, along with many important relics and statues. Even if art isn't your thing, it's worth visiting for the spectacular steel structure outside the museum, a massive installation designed to look like reeds bending under a breeze. Also worth a visit is the Osaka Municipal Museum of Fine Art, home to a collection of ancient Chinese calligraphy and artwork by Japan's most revered artists. Osaka's largest green space, Tennōji Park (Tennōji Kōen), serves as a place of respite from this otherwise busy city. Noted for its many fragrant flower beds and, in spring, its cherry blossoms, the park is a delight to explore thanks also to its many fun sculptures, ponds, and bridges. It's also home to some of Osaka's most important tourist attractions, including the Tennōji Zoo, opened in 1915 and featuring a variety of species including lions, giraffes, and elephants, housed in such a way that they seem to be roaming the African savannah. Also worth a visit is the hippo pool and reptile house. Hot Tip: Try to time your visit for the free tours of the park's greenhouses and other areas not usually open to the public. Looking not unlike the bridge of a large ship - a fact that could be credited to its waterside setting - the Osaka Science Museum (Ōsaka Shiritsu Kagakukan) is a delightful outing for those traveling with kids. Opened in 1989 above the National Museum of Art, the museum contains numerous hands-on and interactive exhibits based on a number of science-related themes covering everything from astronomy to energy sources (it also boasts the country's first planetarium). Also worth a visit is the Osaka International Peace Center (Ōsaka-kokusai-heiwa-sentaa), a museum dedicated, as the name suggests, to matters of peace. Highlights include sobering displays relating to the destruction of war, as well as a replica of the famous Doomsday Clock. In addition to the stunning architecture associated with its museums and art galleries, Osaka boasts many other fine examples of modern architecture. Perhaps the best known is the aptly named Umeda Sky Building (Umeda Sukai Biru), a stunning landmark consisting of two office towers joined at the top by a large platform-like structure. It's this rooftop structure that draws visitors, due largely to the network of bridges and an escalator, which join the two towers, providing plunging views of 170-plus meters that send shivers down the spines of those sensitive to heights. The views from the rooftop observatory and garden - aptly named the Floating Garden Observatory - are simply stunning. Afterwards, be sure to wander the urban garden at its base with its pleasant paths, fountains, and ponds, as well as a fun underground market designed to resemble early-20th century Osaka. One of the city's newest attractions, and quickly becoming one of the top things to do in Osaka, Universal Studios Japan is also one of the city's busiest sites, attracting around 10 million visitors each year. One of only four Universal theme parks worldwide, the Osaka location offers a number of well-known pop-culture franchises, along with a few unique to the location. Recent additions include Hollywood Dream: The Ride, a fun rollercoaster that actually travels backwards at times; rides based on the Spiderman movies; and Universal Wonderland, a family-friendly area perfect for those traveling with younger kids. Uniquely Japanese-themed entertainment and characters are found in rides based on games and TV shows in the Universal Cool Japan area, including Monster Hunter and the One Piece Premier Show. Also of interest to fans of both the books and movies is The Wizarding World of Harry Potter, based on the popular rides in Universal's Island of Adventure in Orlando, Florida. To avoid line-ups, be sure to look into the handy Universal Express Pass. Osaka also happens to be the host city of one of Japan's largest annual festivals. The Tenjin Festival (Tenjin Matsuri) has been held here for more than 1,000 years on the same date, July 24 and 25. It features colourful processions held both on land and on water and culminates with a spectacular fireworks display. Much of the fun takes place around the Tenmangu Shrine, which celebrates the god of scholarship, and provides tourists a chance to experience local customs, see many traditional costumes, and enjoy the city's wonderful hospitality. It's also a chance to get in some souvenir shopping, as well as sampling great food from the many vendors who set their stalls for the occasion. Luxury Hotels: The Intercontinental Hotel Osaka offers oversized rooms in a prime location in the center of all the action. The hotel is an easy 10-minute walk from the central train station. In the tallest building in Japan is the new Marriott Miyako Hotel. Occupying floors 38-57, the hotel features rooms with floor-to-ceiling windows and views out over the city and surrounding plains. On Midosuji Avenue, one of Osaka's most prestigious streets lined with exclusive shops, The St. Regis Osaka offers luxuriously appointed rooms and is just minutes from Osaka Castle. Mid-Range Hotels: Ideal for families and near Universal Studios is the Hotel Universal Port. A ferry departs from behind the hotel and goes to Tempozan Village, where the Ferris wheel is located. 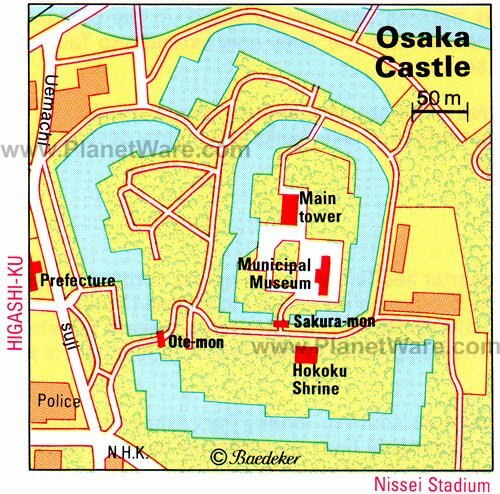 Set midway between the Osaka Castle and the Tennoji Zoo is the Daiwa Roynet Hotel Osaka Kitahama. Standard rooms are comfortably outfitted, and a subway stop is underneath the hotel. The Mitsui Garden Hotel offers spacious rooms in a quiet neighborhood, within walking distance to both Osaka Science Museum and the National Art Museum. Budget Hotels: Located in the Namba area, not far from the zoo is the Business Hotel Mikado. This budget hotel has basic Japanese-style rooms with shared bathrooms and showers. Free bicycles are available for guests. Offering good value and oversized rooms is the well-located Hotel Kinki. 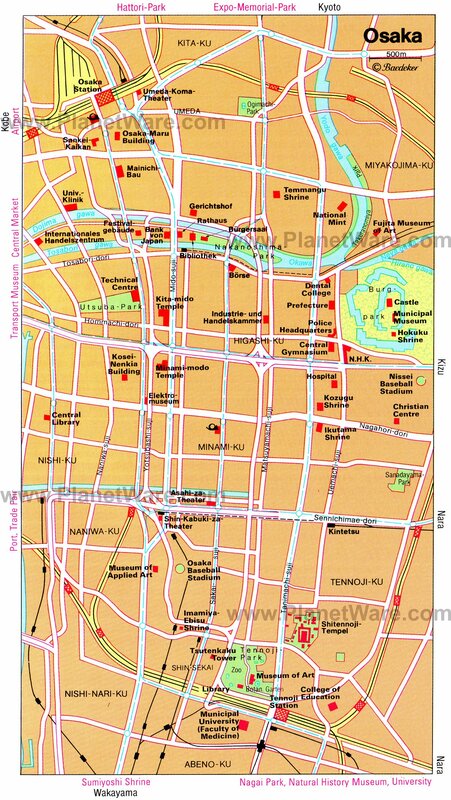 The hotel name refers to the area of the city, and the central train station is a short walk away. Shoulder Season in Osaka: If traveling outside of the busy peak summer season, you'll be rewarded with many unique experiences and sights in Osaka. In winter, the city comes alive with wonderful displays of colorful illuminations and lights. A good time to visit is from November to January, during the Festival of Lights and when beautiful Osaka Castle is lit up for Christmas. Spring is also popular, as the city's parks and gardens burst into life. Day Trips: Osaka is perfectly positioned for adventurous travelers to enjoy a variety of fun day trips. 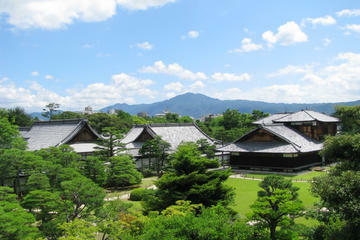 Popular options are the Kyoto and Nara Day Tour including the Golden Pavilion and Todai-ji Temple, and the Hiroshima and Miyajima Full-Day Sightseeing Tour, which takes in two of Hiroshima's top attractions: Itsukushima Shrine and Hiroshima Peace Memorial Park. Benefits include the services of an English-speaking guide, deluxe coaches, and admissions. Places to Visit near Osaka: As well as the fun day trips already mentioned, Osaka is a great jumping off point to explore a variety of other surrounding attractions and points of interest. Easy to access destinations by rail include Kyoto and Hiroshima, each just a couple of hours away by Bullet Train. Explore Japan's Rich History: A great vacation destination for those seeking to immerse themselves in Japan's rich cultural traditions is Fukuoka. In addition to its magnificent castle and many fine shrines and temples, the city offers immersive experiences, including origami and calligraphy. 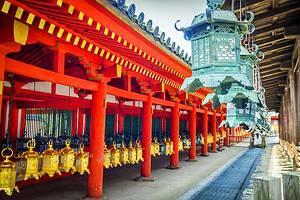 Similar experiences and other historical attractions can of course be enjoyed in other historic cities such as Nara and Sapporo. Japan Vacation Ideas: Japan offers no end of jaw-droppingly beautiful scenery. No trip should therefore skip the iconic Mount Fuji, easily accessible from Tokyo and its many attractions. 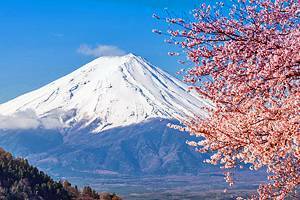 If your itinerary doesn't allow a visit to the mountain, you can at least catch a good look at it as you whizz past on a high-speed Bullet Train to destinations such as Nagoya.